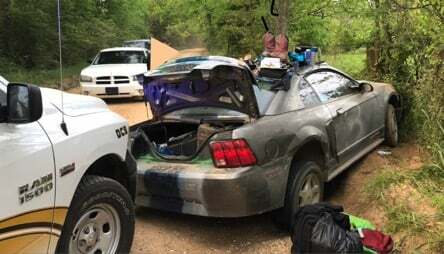 A 43-year-old has been arrested after a police chase in Arkansas. The man spray painted a #3 on the doors of the vehicle. A nod to NASCAR’s legendary 7-time champion Dale Earnhardt. Drug Task Force Agents and a Drew County Narcotics were notified of a suspicious vehicle that was parked at a local business. Upon investigation, the officers noted odd behavior at the location. In the parking lot, sat a grey Mustang. That Mustang lacked license plates but featured a #3 spray painted on the door. They pulled over the driver of the Mustang. At the time, the official reason for stopping the car was a lack of tags. However, the driver of the #3 Mustang hit the gas and attempted to escape the police. He led the police on a 6 mile trail through Arkansas. The police chase came to an end on South Allis Road. Ratliff ended up jumping the cushion and putting it in the ditch. The driver attempted the escape the ditch. However, Police had already boxed in the driver. As the Mustang driver attempted to reverse from the ditch, he struck the police vehicle. 43-year-old, James Ratliff of Dermott was arrested at the scene. He was taken into custody of the Drew County Sheriff’s office. Inside the vehicle, police found methamphetamine. Ratliff was charged with fleeing and possession of methamphetamine. Bond was set at $35,000 as reported by Monticello Live.